One of the foundations of a strong reading and writing workshop is providing students access to a wide variety of excellent mentor texts. You may provide access to those books through your classroom library, school media center, or public library–but how do you know which books to purchase? How do you predict which titles will be most popular with teens? How do you know which authors will teach your students the most about writing? We hope to offer you a few answers to these questions on Shelfie Saturdays. Here, we’ll share shots of our classroom library shelves, bookstore tables, yard sale treasures, and more. We hope these will act as examples of which books to buy, how to shelve them, and which ones to get into the hands of your readers. 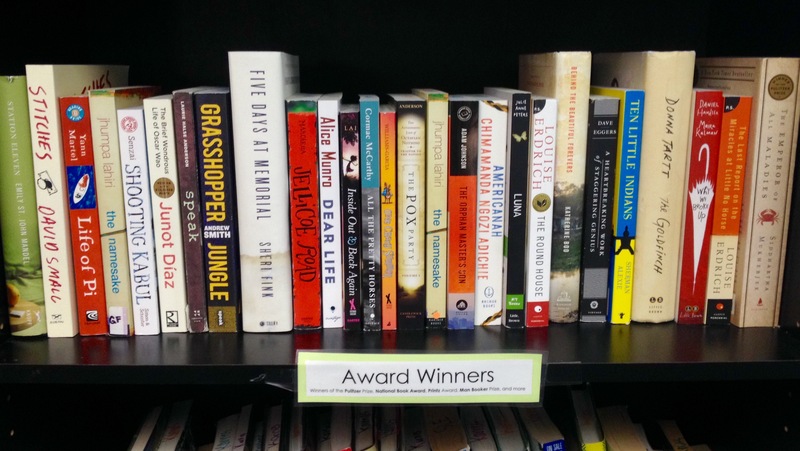 So, to get us started, here’s one of my most popular library shelves–the Award Winners shelf. This shelf houses winners of the Printz Award for Young Adult Literature, the Pulitzer Prize, the Man Booker Prize, the National Book Award, and more. I also include nominees for all of those awards, as well as honorable mentions. The genres are varied–YA, nonfiction, general fiction, even multigenre. The books are at a range of difficulty levels–some have complex narrative structures, others are very long, and others are tough only because of their dense topics. Students gravitate toward The Goldfinch, Jellicoe Road, Grasshopper Jungle, The Round House, and Why We Broke Up more than any other texts on this shelf. Again and again, I hear the same refrains during conferences regarding award-winning books–this book was hard, but I finished it because I just couldn’t put it down. Award winners are shelved so for a reason–they’re the best writing has to offer in a given year, and are incredibly valuable teachers for the young readers and writers in my classroom. Join the conversation by posting your own shelfies! 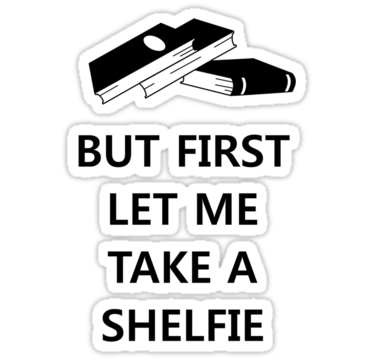 Share a shelfie with #shelfieshare and let us know if it’s a #classroomshelfie, #bookstoreshelfie, or other miscellaneous find. I’ve got a shelf that’s YA to Read Again and Again that are all Printz winners. I hadn’t thought to make one Award Winner shelf, but now I might. I like the idea of mixing the genres up. I really like this idea. It could be used at nearly every level in school from, early elementary right up through H.S. I am wondering if a student group might also help with books to go on a “TRY THIS ONE” shelf?